This deluxe storm door hardware set includes an elegant lever handle, interior latch, and keyed deadbolt It is compatible with most pre-installed handles, and compliments a wide range of dicor styles. The elegant and easy to operate handle replaces the basic push button handle that may already be on your screen door. The interior latch features an easy opening push movement. The matching keyed deadlock lock provides additional security, so you can keep your main door open and enjoy the light and fresh air while still feel safe (this is not a high security lock, but a secondary level of security). The long-lasting finish will provide an added touch of class to any storm door. This set includes everything needed for an easy installation and will fit doors from 1 to 2-1/8 thick. Installation should take about 30 minutes. When replacing an existing handle, the screw posts for the handle must be 1-3/4 apart. Adding security for your family and property is easy with this reliable electronic keypad deadbolt with matching passage lever. Defiant keyless entry technology brings peace of mind without the worry of losing keys. All Defiant Deadbolts come with enhanced security features such as an Anti-Saw rod, Anti-Drill Shield, and 3 pick resistant pins to help deter any unwanted entry. Its user-friendly features offers ease of installation, operation and customizable programming, and is backed by a 1 year electronic warranty. Forge's traditional jimmy proof lock can be installed for left- or right-handed operation. Its solid construction provides added security and peace of mind, and is the main reason that it continues to be so popular. The traditional jimmy proof lock has stood the test of time. Ideals SK5 interior deadbolt lock adds security to your storm and screen door. Quick and easy to install, the SK5 allows you to bolt the door from the inside. SK5 installation requires drilling 2 new holes on the surface of your door and installing a strike plate on the jamb. Install above the handle, high enough for your convenience. If you have young children at home, the SK5 can be mounted high enough so they cannot reach it and leave without permission. The SK5 allows you to open your main door for light or ventilation, but feel more secure by having your storm door locked. The SK5 is not a high security lock and may not prevent a break in, always be on guard of your home, family and possessions. The SK5 can be used on left or right opening doors by simply turning it over. Keyed versions of interior deadbolts for storm and screen doors are available from Ideal Security in the SK703 and SKGLK series. This is original equipment quality. Deluxe Storm & Screen Door Lever Handle & Keyed Deadbolt This deluxe storm door hardware set includes an elegant lever handle, interior latch, and keyed deadbolt It is compatible with most pre-installed handles, and compliments a wide range of dicor styles. 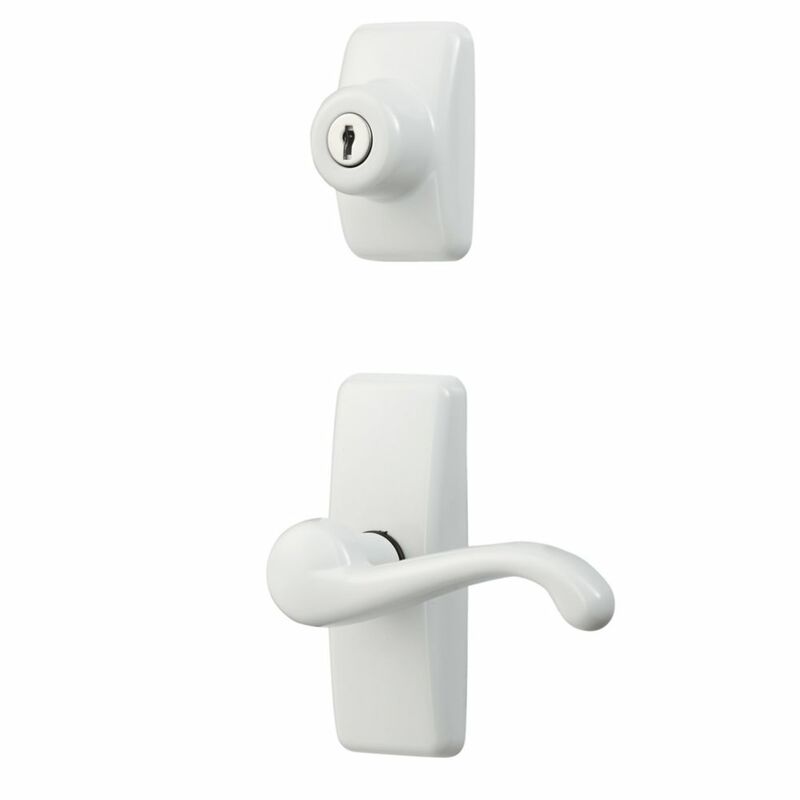 The elegant and easy to operate handle replaces the basic push button handle that may already be on your screen door. The interior latch features an easy opening push movement. The matching keyed deadlock lock provides additional security, so you can keep your main door open and enjoy the light and fresh air while still feel safe (this is not a high security lock, but a secondary level of security). The long-lasting finish will provide an added touch of class to any storm door. This set includes everything needed for an easy installation and will fit doors from 1 to 2-1/8 thick. Installation should take about 30 minutes. When replacing an existing handle, the screw posts for the handle must be 1-3/4 apart. Deluxe Storm & Screen Door Lever Handle & Keyed Deadbolt is rated 3.9 out of 5 by 26. Rated 5 out of 5 by JK from Was easy to switch out old handle with this new... Was easy to switch out old handle with this new one. All of the parts I needed were included. Rated 1 out of 5 by Marty from They sure didn’t fit our Anderson storm/screen door. Returned... They sure didn’t fit our Anderson storm/screen door. Returned them to Home Depot store the next day. Rated 2 out of 5 by Danika from I only down star it because the package was missing... I only down star it because the package was missing half the pieces. Only the bolt was in the box, not the door handle. Rated 5 out of 5 by HomeDepotCustomer from Was exactly as shown online and the quality was good.... Was exactly as shown online and the quality was good. No complaints. Will order another one since I need it to finish upgrading. Rated 4 out of 5 by Ed from Very easy to install kit. Was able to use on... Very easy to install kit. Was able to use on a 3/4” thick storm door. Good quality. I would buy it again.